Michael loved his companion, Melanie, his family, flying and the Cincinnati Reds. He lived his life with passion, devotion and was tremendously loyal to those he loved. He practiced orthopedic surgery, specializing in hand surgery, at Mt. 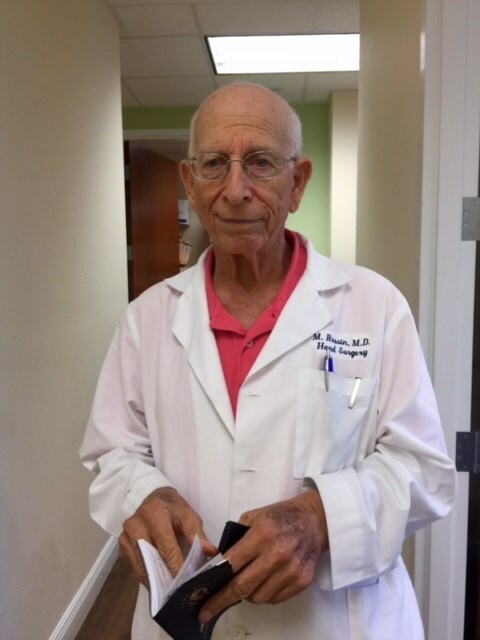 Sinai Medical Center on Miami Beach for over 45 years. He was fortunate to have been able to practice medicine at the same hospital as his father, Lester, and his brother David. 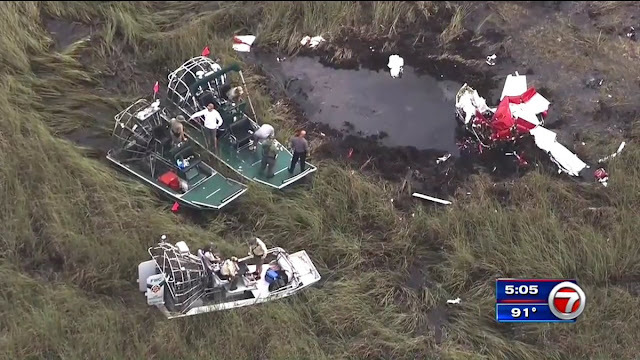 On July 3, 2016, about 0930 eastern daylight time, an experimental amateur-built Van's Aircraft RV-7A, N1075F, was destroyed when it impacted a swamp about 10 nautical miles north of Weston, Florida. The private pilot was fatally injured. The airplane was registered to and operated by the pilot under the provisions of Title 14 Code of Federal Regulations Part 91. Visual meteorological conditions prevailed, and no flight plan was filed for the personal flight that departed Boca Raton Airport (BCT), Boca Raton, Florida, about 0915, destined for Opa-Locka Executive Airport (OPF), Miami, Florida. On the morning of the accident, the pilot departed OPF about 0730 and arrived at BCT about 0800, where he met an acquaintance to show him the airplane and discuss the installed avionics. He departed BCT about 0915. Radar data provided by the Federal Aviation Administration (FAA) showed the airplane on a southwesterly track from BCT, with the last several radar returns indicating a descending left turn that began about 1,500 ft mean seal level (msl) and ended at 700 ft msl, about 1/2 nautical mile from the accident location. No witnesses to the accident were identified. The airplane was located the following morning by search and rescue personnel. The pilot held a private pilot certificate with ratings for airplane single-engine land, airplane multi-engine land, and instrument airplane. His last FAA third-class medical certificate was issued on January 8, 2015. According to his logbook, he had accumulated about 3,600 hours of flight experience. 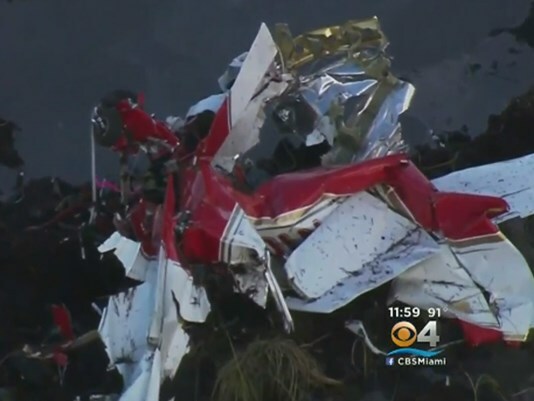 A family member reported that the pilot purchased the airplane about 10 days before the accident flight. According to the pilot's logbook, he flew the airplane on 4 occasions between June 24 and July 2, 2016, for a total of 2.5 hours. The two-seat, single-engine, low-wing airplane was built in 2010 and was equipped with a Lycoming O-360-series engine. The most recent condition inspection was completed on June 3, 2016, at 308 total airframe and engine hours. At 0953, the reported weather conditions at Fort Lauderdale Executive Airport (FXE), Fort Lauderdale, Florida, located about 14 miles east of the accident site, included wind from 110° at 10 knots, visibility 8 statute miles in light thunderstorm rain showers, scattered clouds at 2,300 ft, scattered clouds at 3,300 ft, broken ceiling at 6,000 ft, temperature 26°C; dew point 24°C, and altimeter setting 30.13 inches of mercury. 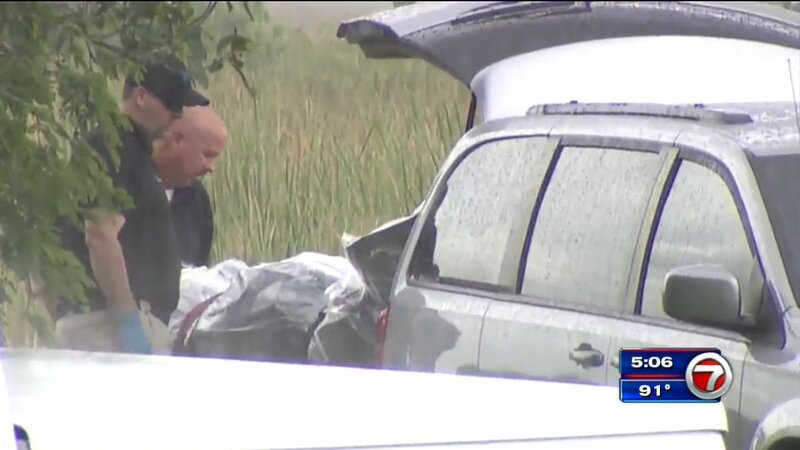 Review of weather radar images did not reveal any precipitation along the accident route or near the accident site. 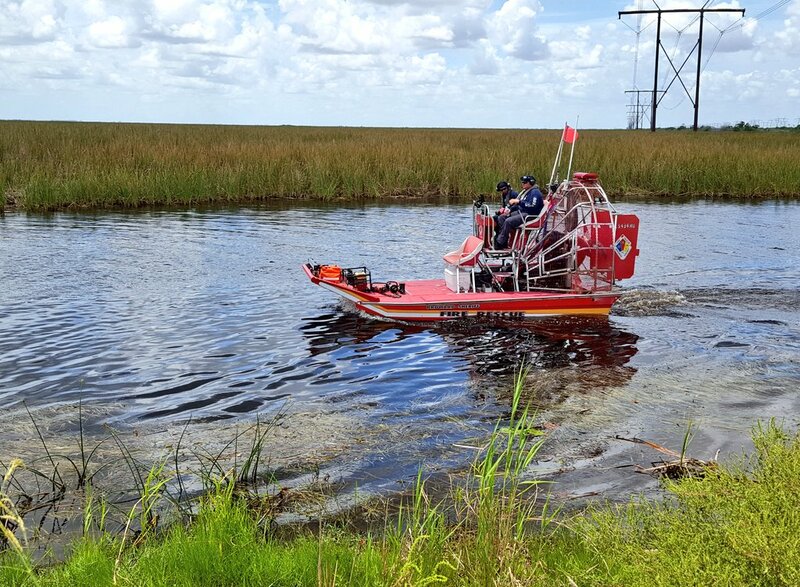 The accident site was in flat swamp and sawgrass terrain at an elevation of about 13 ft. All major components of the airplane were accounted for at the scene. The wreckage path was teardrop shaped, about 50 ft long by 30 ft wide, and oriented about 130° magnetic. Wing tips, sections of fairings, cowling, seat cushions, and other small pieces associated with the airplane were in a wide arc surrounding the initial impact crater. The distance from the initial impact crater to the main wreckage was about 25 ft. A slight odor of fuel was present. The cockpit, cabin area, and tail section were significantly fragmented and largely contained on the muddy perimeter of the initial impact crater, which was full of water. The main wing spar was fractured in multiple pieces and located on the side of the impact crater. 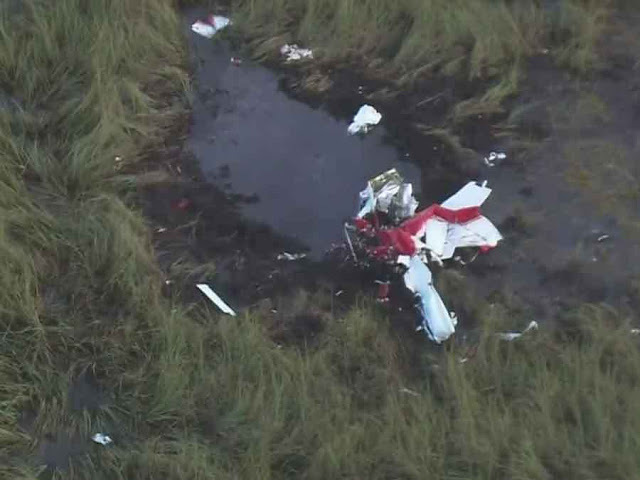 All flight control surfaces were located at the accident scene. Both ailerons were separated from their respective wings. The inboard one-third of the left aileron was bent upward about 80°; the right aileron was dented and damaged at both ends but otherwise relatively intact. The empennage was buckled just forward of the horizontal stabilizer and was twisted toward the left. Both elevators remained attached, exhibited minor damage, and moved freely. The vertical stabilizer was crushed aft, and the rudder was crushed and partially separated from the stabilizer. The engine was separated from the firewall, and the propeller was separated from the engine at a crankshaft fracture consistent with overload, just aft of the propeller flange. Both propeller blades were bent aft and exhibited slight twisting. The airplane was recovered to a secure facility for further examination. Aileron control continuity was confirmed from the pilot control stick through overload fractures in the push-pull tubes and rod ends to both aileron input rods. Elevator control continuity was established from a bellcrank located behind the seats, though an overload fracture in a rod-end attachment fitting to the elevators. The rudder cables remained attached to both rudder control horns, and continuity was confirmed through overload tensile breaks in both cables to the rudder pedals, which were separated from the fuselage. The fuel selector valve was in the "RIGHT" fuel tank position. The engine remained attached to its mounts, which were separated from the firewall. The No. 2 cylinder pushrods, the carburetor, and exhaust components were found separated from the engine. The engine was rotated by hand at the accessory gear section, and crankshaft continuity was confirmed. Valve action was observed at cylinder Nos. 1, 3, and 4, and valve lifter action was observed for cylinder No. 2. Thumb compression was attained on all cylinders. The engine-driven fuel pump contained a blue liquid consistent with 100 low-lead aviation fuel and produced suction and pressure when activated by hand. The carburetor floats exhibited damage consistent with hydraulic crushing. The float bowl contained a teaspoon of clear liquid. The inlet fitting was impact fractured and exposed to mud/water. The impulse-type left magneto was partially separated from the engine and did not produce spark when rotated. Disassembly of the left magneto revealed that the plastic arm that held the contact points in place was impact fractured, and the points were displaced. The right magneto produced spark on all towers when rotated after water was drained from the unit and the contact points were wiped clean. All spark plugs electrodes were contaminated with mud and/or engine oil. The engine oil filter element was absent of debris. The internal oil suction screen contained a small amount of debris but was unobstructed. Remnants from the primary flight display, a handheld GPS receiver, and a damaged tablet computer were retained and forwarded to the NTSB laboratory in Washington, DC, for data readout. Due to impact damage, data were not recovered from any of the units. The Broward County Medical Examiner, Fort Lauderdale, Florida, performed an autopsy on the pilot. 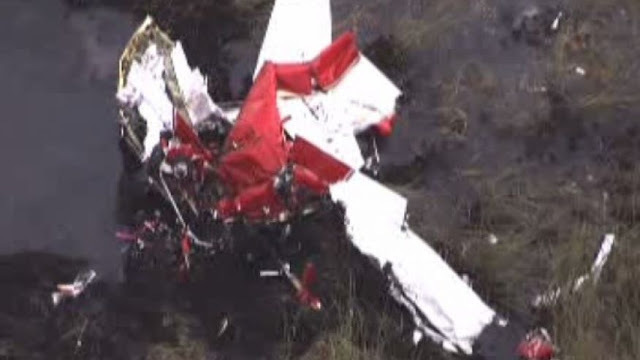 According to the autopsy report, the pilot's cause of death was multiple blunt force injuries. The examination of the body for natural disease was limited due to the degree of damage. A readout of the pilot's pacemaker performed during the autopsy did not identify any significant arrhythmia at or around the time of the accident. Toxicology testing was performed by the FAA Bioaeronautical Sciences Research Laboratory, Oklahoma City, Oklahoma. The toxicology report stated that ethanol was detected in muscle (98 mg/dl) and in liver (35 mg/dl), and N-butanol and N-propanol were identified in muscle. In addition, metoprolol and valsartan were identified in liver and lung. Ethanol can be produced in postmortem tissues by microbial action. This often occurs in conjunction with the production of other alcohols such as N-propanol and N-butanol. Metoprolol and valsartan are prescription medications used to treat high blood pressure. According to FAA records, the 78-year-old pilot had previously reported coronary artery disease with a bare metal stent placed in 2003, high blood pressure, chronic kidney disease, removal of a bladder stone, prostate cancer treated with radioactive seed implantation, and a pacemaker placement in 2009. At the time of his last FAA medical examination, he reported using valsartan and metoprolol to treat his blood pressure and help prevent a heart attack. In addition, he was on clopidogrel to prevent clots forming in the stent and simvastatin to control his cholesterol. None of these medications are considered impairing. 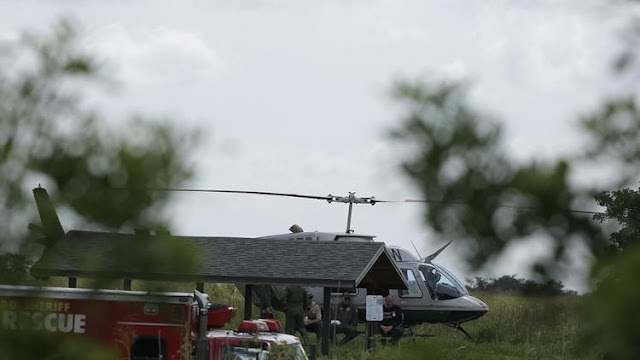 No significant abnormalities were identified during the pilot's most recent FAA examination. The airplane was equipped with an Artex model ME406 emergency locator transmitter (ELT), which did not activate during the accident sequence. During the postaccident examination of the airplane, the internal battery connector was found disconnected inside the unit. According to the airplane maintenance records, the battery was replaced on June 3, 2016. On July 3, 2016, at 0930 eastern daylight time, an experimental amateur built Vans RV-7A, N1075F, was destroyed when it impacted a swamp about 10 nautical miles north of Weston, Florida. The private pilot was fatally injured. Visual meteorological conditions prevailed, and no flight plan was filed for the personal flight that departed Boca Raton Airport (BCT), Boca Raton, Florida, about 0915, destined for Opa-Locka Executive Airport (OPF), Miami, Florida. The flight was conducted under the provisions of 14 Code of Federal Regulations Part 91. 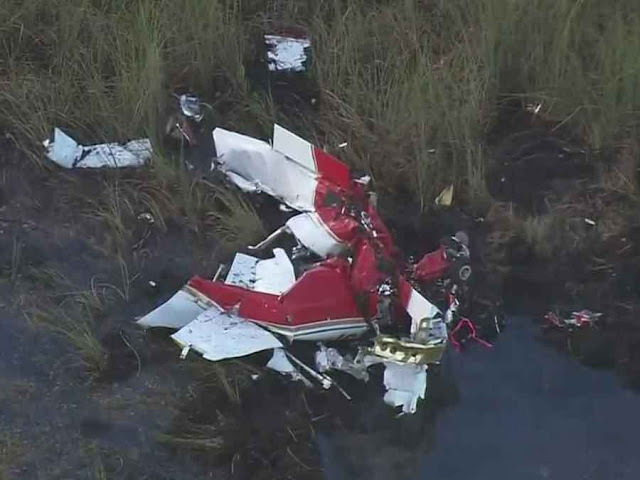 A family member reported that the pilot purchased the airplane about 10 days prior to the accident flight. According to the pilot's logbook, he flew the accident airplane on four occasions between June 24 and July 2, 2016, for a total of 2.5 hours. On the morning of the accident, he departed OPF at 0730, and arrived at BCT at 0800, where he met an acquaintance to show him the airplane and discuss the installed avionics. He departed BCT at 0915. Preliminary radar data provided by the Federal Aviation Administration (FAA) depicted a visual flight rules (1200 code) radar target on a southwesterly track from BCT, with the last several points indicating a descending left turn which began from about 1,500 feet mean seal level (msl), and ended at 700 feet msl, about 1/2 nautical mile from the accident location. The airplane was located the following morning by search and rescue personnel. 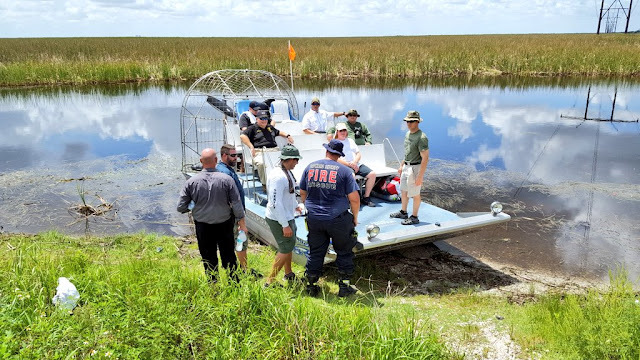 The wreckage came to rest inverted on flat swamp and sawgrass terrain at an elevation of about 13 feet, in the vicinity of 26.2544 degrees north latitude, -80.4155 degrees west longitude. All major components were accounted for at the scene. The wreckage path was teardrop shaped, approximately 50 feet long, 30 feet wide and oriented about 130 degrees magnetic. Wing tips, sections of fairings, cowling, seat cushions, and other small pieces associated with the airplane were located in a wide arc surrounding the accident site. The distance from the initial impact to the main wreckage was about 25 feet. A slight odor of fuel was present. The cockpit, cabin area, and tail section were significantly fragmented, and largely contained on the muddy perimeter of the initial impact crater, which was full of water. The main wing spar was fractured in multiple pieces and located on the side of the impact crater. 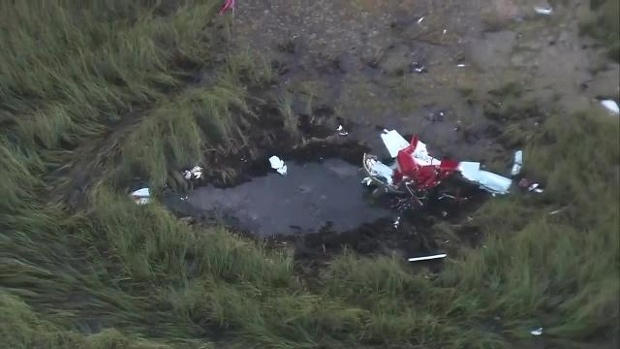 All flight control surfaces were located at the accident scene. Both ailerons were separated from their respective wings. The inboard one-third of the left aileron was bent upward about 80 degrees; the right aileron was dented and damaged at both ends, but otherwise relatively intact. The empennage was buckled just forward of the horizontal stabilizer, and was twisted toward the left. Both elevators remained attached, exhibited minor damage, and moved freely. The vertical stabilizer was crushed aft, and the rudder was crushed and partially separated from the stabilizer. The engine was separated from the firewall, and the propeller was separated from the engine at a crankshaft fracture consistent with overload, just aft of the propeller flange. Both propeller blades were bent aft and exhibited slight twisting. The airplane was recovered to a secure facility for postaccident examination. Aileron control continuity was confirmed from the pilot control stick through overload fractures in the push-pull tubes and rod ends, to both aileron input rods. Elevator control continuity was established from a bellcrank located behind the seats, though an overload fracture in a rod-end attachment fitting, to the elevators. The rudder cables remained attached to both rudder control horns, and continuity was confirmed through overload tensile breaks in both cables, to the rudder pedals, which were separated from the fuselage. The fuel selector valve was in the RIGHT fuel tank position. The engine remained attached to its mounts, which were separated from the firewall. The No. 2 cylinder pushrods, carburetor and exhaust components were found separated from the engine. The engine was rotated by hand at the accessory gear section. Crankshaft continuity was confirmed and valve action observed at cylinder Nos. 1, 3 and 4, and valve lifter action for cylinder No. 2. Thumb compression was attained on all cylinders. The engine-driven fuel pump contained a blue liquid consistent with 100 low-lead aviation fuel, and produced suction and pressure when activated by hand. The carburetor floats exhibited damage consistent with hydraulic crushing. The float bowl contained a teaspoon of clear liquid. The inlet fitting was impact fractured and exposed to mud/water. The impulse-type left magneto was partially separated from the engine, and did not produce spark when rotated. The plastic arm which held the contact points in place was impact fractured and the points were displaced. The right magneto produced spark on all towers, after water was drained from the unit and the contact points were wiped clean. All spark plugs electrodes were contaminated with mud and/or engine oil. The engine oil filter element was absent of debris. The internal oil suction screen contained a small amount of debris, but was unobstructed. Remnants from the primary flight display, a handheld GPS receiver, and a damaged tablet computer were retained and forwarded to the NTSB laboratory, Washington, DC for data readout. The pilot held a private pilot certificate with ratings for airplane single and multiengine land, and instrument airplane. His last FAA third-class medical certificate was issued on January 8, 2015. According to his logbook, he accumulated a total of 3,600 hours of flight experience. The amateur-built two-seat, single engine, low-wing airplane was built in 2010 and was equipped with a Lycoming O-360 series engine. The most recent conditional inspection was completed on June 3, 2016, at 308 total airframe hours.